Would you like to smell like Tahitian gardenias and citrus? Then this lip and body balm by Marie is perfect for you. It’s a very simple recipe. In addition to the Monoi de Tahiti, the recipe uses another wonderful oil that’s been used by Hawaiians for centuries. There’s another oil used in the recipe that’s noted for healing and rejuvenating skin. When the oils are combined with beeswax, it creates a balm that absorbs quickly into the skin and smells like an island vacation. 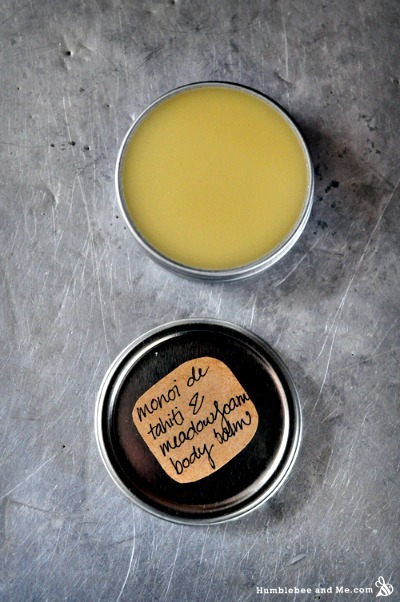 Click the How to Make Homemade Monoi de Tahiti and Meadowfoam Lip & Body Balm link below to see Marie’s wonderful recipe.